Yes my friends it is Girl Scouts cookie time again! The time that cute little kiddos stand outside of the grocery store selling for a good cause and the time of the year that I am sure the owners of Weight Watchers look forward to. Of course it should be easy to politely decline, but who among us can turn down those adorable faces that are counting on us as the consumers to fund their Girl Scouts activities? I will not be responsible for little Suzy Q being on the street when she is 16 because I did not help to pay for this wonderful group who is giving her self esteem. Not to mention the fact that those little thin mints are so darn yummy. Combining two things I adore-chocolate and minty goodness...irresistible. The only problem is that the only thing thin will be those cookies, because my bootie will not be so if I keep eating them. oh my god I know. I already have some on order but I still bought three more boxes at the store today. GREAT POST! i HOPE YOU REALIZE THAT THIN MINTS FREEZE WELL! Kelly-My mom just brought me two more boxes today so I feel your pain! Plantress-Thanks! I did hear that you can freeze them. I think I am going to do that. TMC-I think that would be the safest thing to do. Safe for my caloric intake that is! LOL! 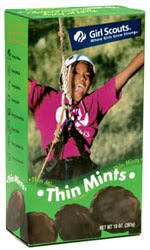 I just give the girl scout the money for a box of cookies and tell her to keep the box to do what she wants with it. Ugh, the curse of being diabetic! Intense Guy-that is nice of you to buy them even if you can't enjoy them. Diabetes does make it harder to enjoy some things. My dad has it so I know it isn't the easiest thing to deal with. I Know! I have managed to go through one box this year already. The rest I put in the top of the pantry so that I have to go searching for them. So far so good. I have yet to break into the 4 boxes stashed up there. Is This How Grown Up Princess Rooms Look?